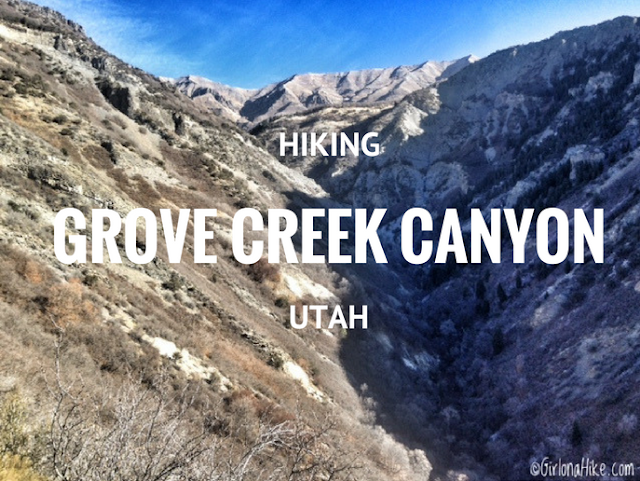 Grove Creek Canyon is located to the east of Pleasant Grove, Utah. 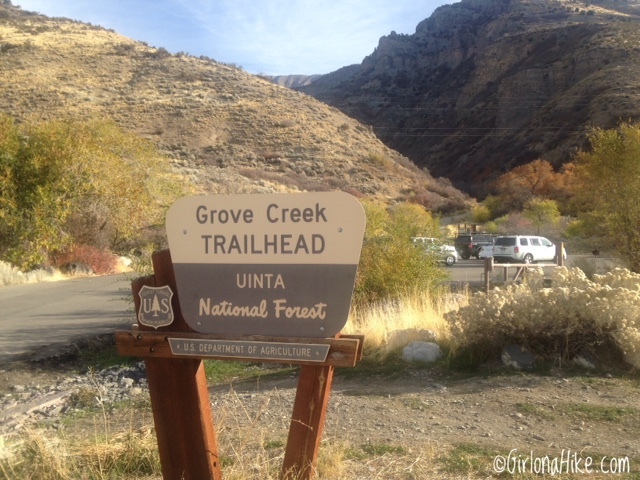 It leads you through a somewhat narrow canyon, that eventually connects with the Great Western Trail. Along the way you'll have an amazing view of South Mt. Timpanogos, and pass two waterfalls - the first which is inaccessible, and the 2nd you could probably find a way down to yet wouldn't be easy. 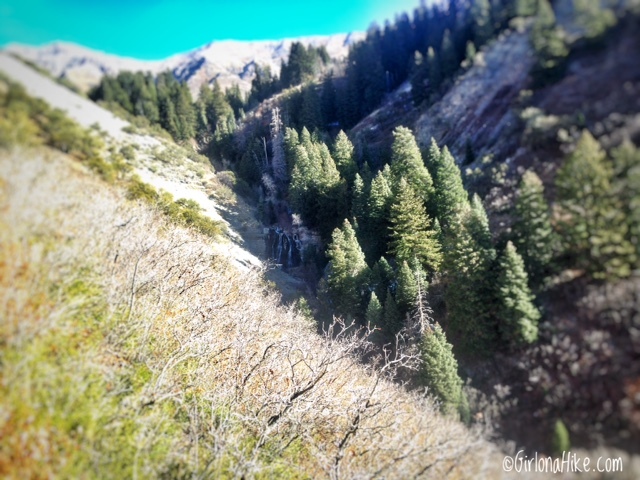 Most hikers and runners enjoy viewing the waterfalls from the trail, as it looks directly down to them. At the top of the 2nd waterfall there is a bench to take in the view and a bridge that crosses the creek. This is where most people turn around, making a nice 4 mile RT hike. Dogs are allowed off leash on this trail, but I would avoid hiking it when it's really hot outside - there is zero shade. As always, bring plenty of water for both you and your dogs. Dogs can easily drink from the stream at the bridge. 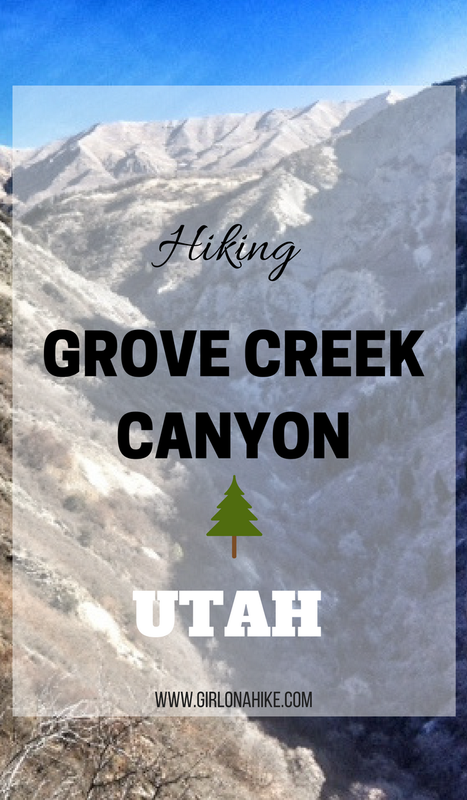 From SLC, drive south on I-15 and take exit 275. Drive on Pleasant Grove Blvd, straight across Main St. 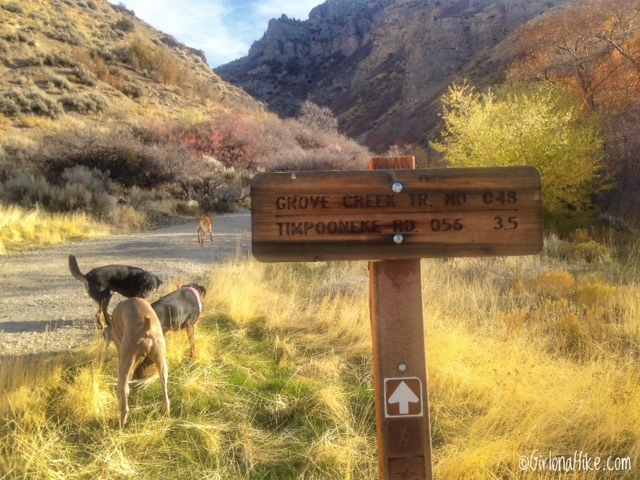 Turn left on S 100 E, then right onto E 500 N. Drive to the very end of this road where you'll see the sign for Grove Creek Canyon TH. Here is a map. Kid friendly? 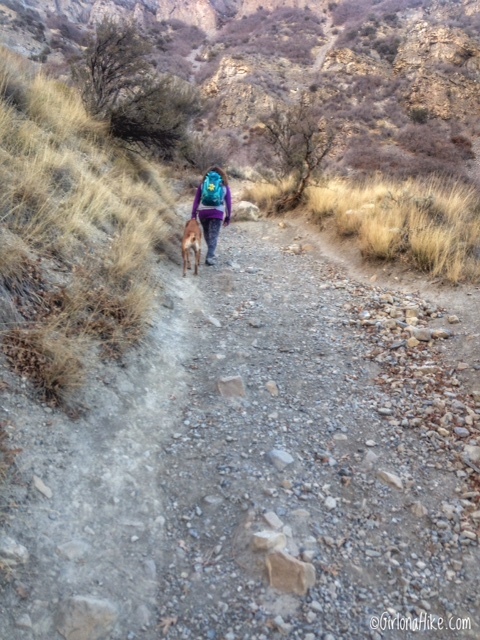 Yes, however some sections of the trail are very narrow. Hold hands with the little ones on those sections. 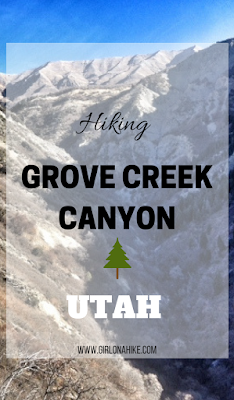 Driving up to the TH, you should see the Grove Creek sign. Starting out, walk up the very wide dirt road and you'll pass by this sign. Continue up the wide dirt road, and after about 10 minutes of hiking you'll see a small trail split off to the left. You'll need to turn there. 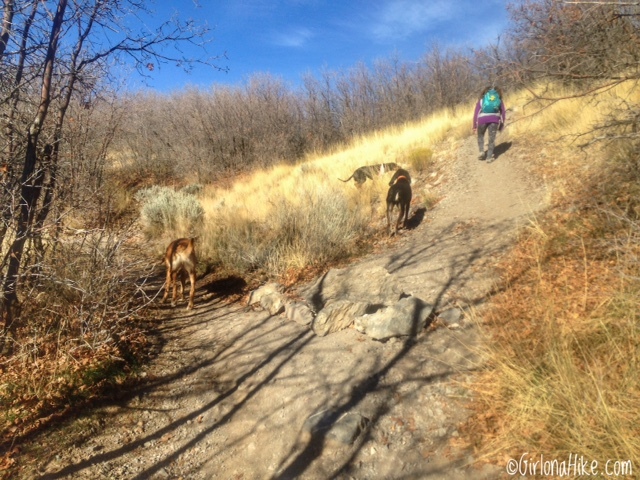 Just after the trail split, the trail gets really steep for about 20-30 feet. 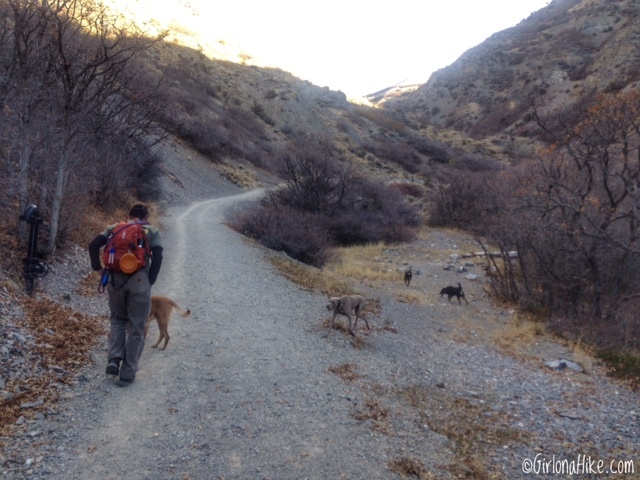 The trail eventually makes one switchback, chasing directions from East to West. 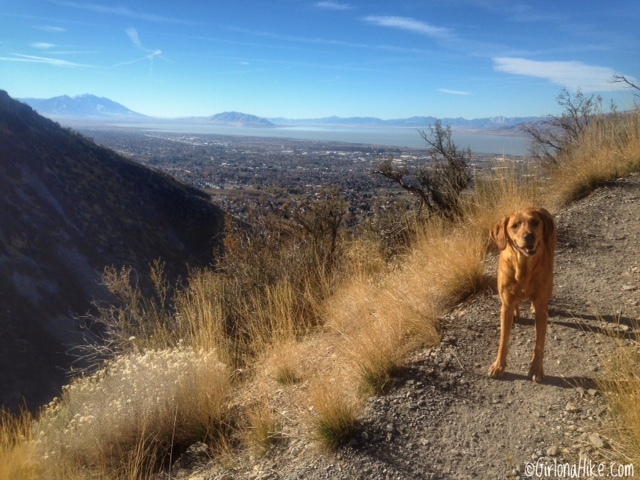 You should have a great view of Pleasant Grove and Utah Lake. 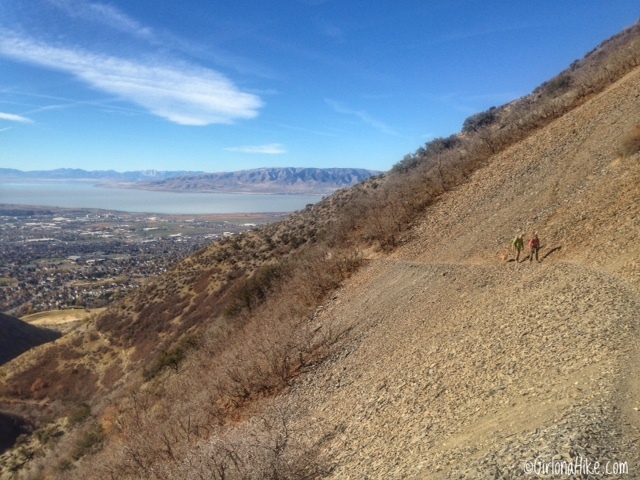 You'll see what looks like another trail split - they both end up the same place. Going left is easier. After the 2nd switchback, you should have an awesome view of Grove Creek Canyon and the Timpanogos ridge. The trail does have a few spots where the trail drops off to the right. If you have little kids, this is the section you may want to keep a close on them. Looking back down the trail. Utah lake in the distance. The group leads the way...Just after this rocky section, keep an eye down in the bottom of the canyon for the first waterfall. You may not be able to view it in summer with all the leaves still on the trees. If you aren't looking for it, you'll definitely miss it. 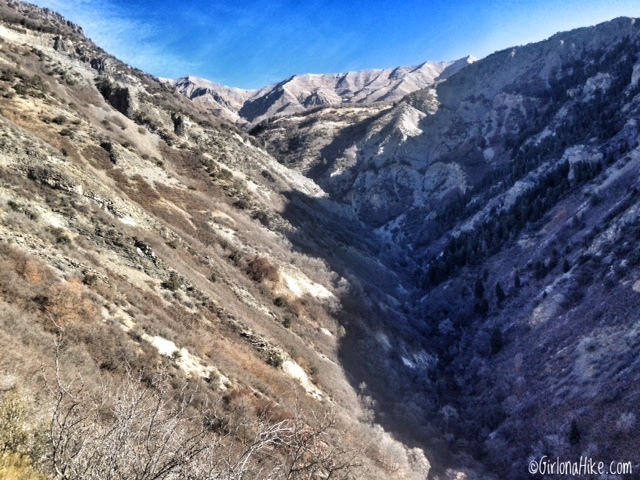 Around 1 3/4 mile in, you should clearly be able to see the 2nd waterfall. Continue hiking until you reach the bridge. 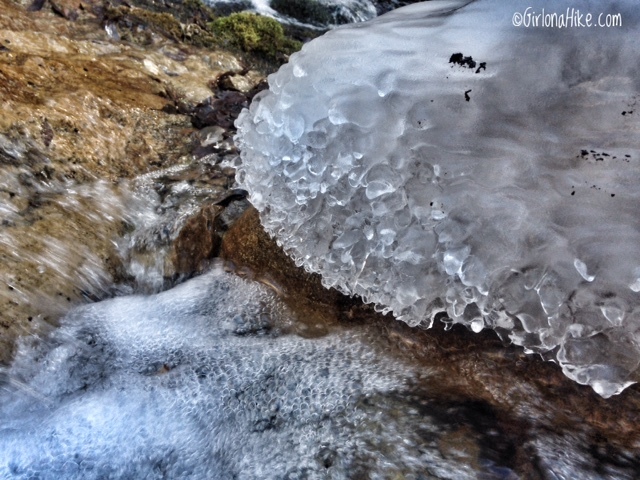 There was a winter storm 2-3 days before we hiked here, and ice still covered some of the rocks. 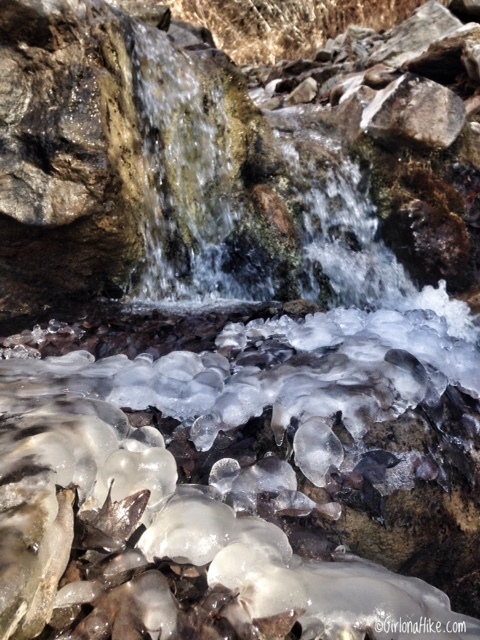 More of the ice-covered stream at the bridge. Charlie looks very suspicious....maybe he should be! 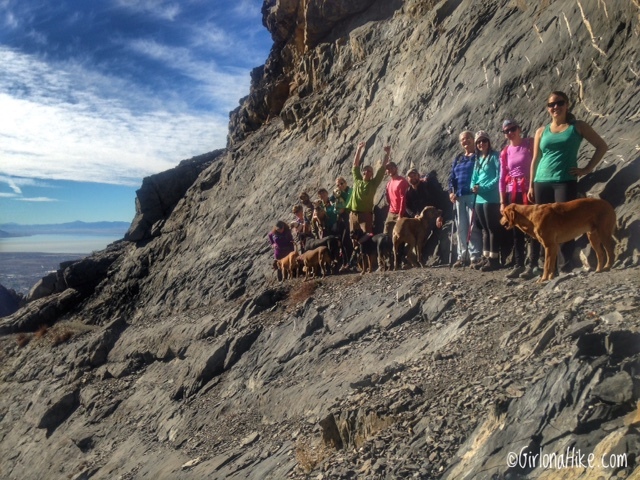 Our Meetup group, Hiking in Utah with Our Dogs! 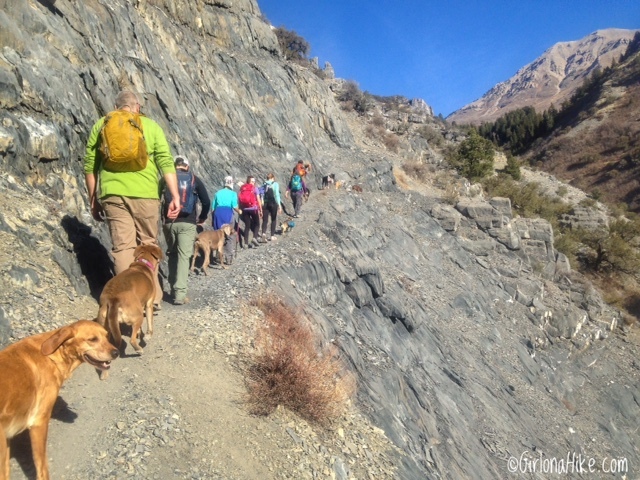 This hike we had about 13 people and 15 dogs. 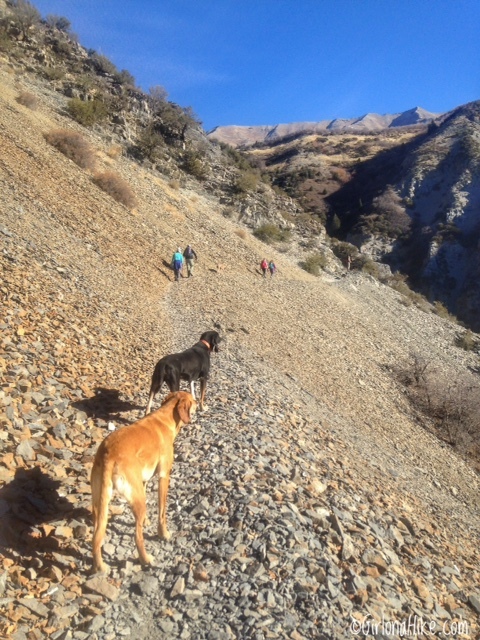 The dogs love hiking as a pack! Trail map via Gaia GPS. 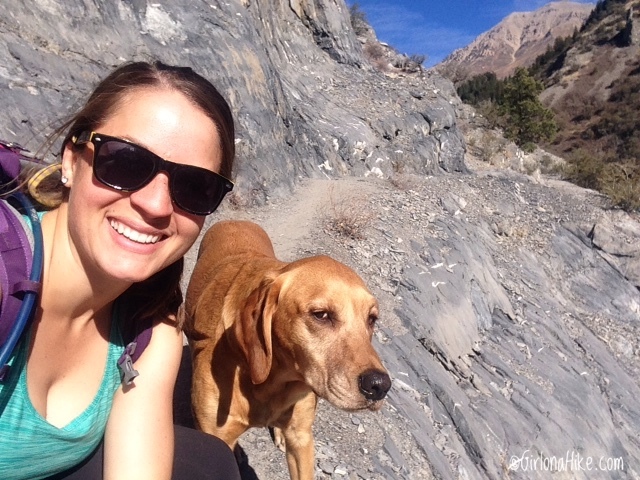 Save this hike to Pinterest!